Epoxy-based finishing enamels – Imavolt S.A. This is a two-component system with solvents and a high content of solids, curing agents, and poluamine and polyamide adducts. 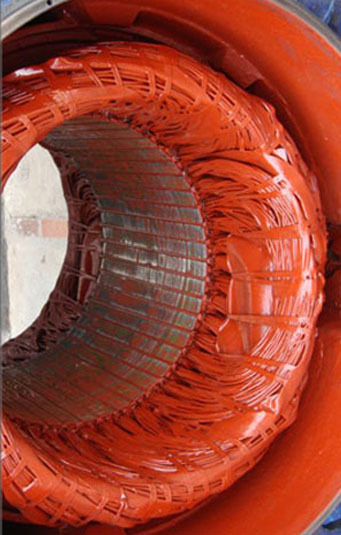 It is suitable as a finishing material for any kind of electric machines (engines, generators, etc.) due to its good chemical resistance to atmospheric agents, abrasion and impact. Mix pigmented base (component A) with the reagent (component B), in a 5:1 relation to volume (component A: component B). Mix without diluting and wait at least 1 hour of pre-reaction time. The mix must be used within 8 hours. It can be kept for a longer time if it is stored at temperatures lower than 5ºC. During application, drying and curing, room temperature must not be lower than 15ºC. Touch-dry is after 2 hours and hard dry in 8 hours, with final curing after 6 or 7 days. Brush application gives 8mts2/liter, with thicknesses of 50 to 70 microns of dry film. As these are chemical products we recommend avoiding direct eye or skin contact. Wash with soap and water. Brushes, spray painters or rollers must be washed with our diluent prior to hardening.